Yesterday I went badly off course with eating and I wasn’t even going to record it because it’s soooo embarrassing, not to mention nutritionally dubious. I had decided to not record my eating, to just ‘go with the flow’ and eat whatever without thinking too much about it. One day I may be able to pull this off but yesterday my brain interpreted this as an excuse to eat mass amounts of crap and it got dangerously close to a food binge – and that’s before the party! At about 5.30 I noticed that familiar ‘binge zone’ feeling where I’m really uncomfortably full but feel like I have to keep eating ‘while I’ve got the chance’. 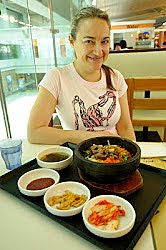 So, I took heed, sat down, recorded what I’d eaten (not so easy because I’d been on ‘autopilot’) and got the upper hand. I had a really great time at the party, did lots of dancing and only had one cocktail and one ouzo. I haven’t been drinking at all lately and the ouzo made me feel badly nauseous and so I stopped there. Calories worked out at about 2500 for the day, which was a lot considering I was fasting until 3.30, but I feel happy with that (it could have been OH so much worse) and woke up today feeling great but also strangely ravenous. It’s been ages since I woke up hungry and I wonder if it was the alcohol that did it. Either that or I was dehydrated. I certainly wasn’t starving, considering the stack of pita bread, half chicken and two slices of birthday cake I’d eaten for dinner. Yesterday I took an extra rest day (supplemented with several hours of greek dancing and – uh – the Macarena). This is only because I was not well organised and didn’t realise that time had raced on and I was due at the greek party, like, half an hour ago! Eek. 2. BBQ. Meat and veges at the party part 2. We like to make a big deal of everything..
5. Marinated chicken and chickpea invention… done in a little white wine, olive oil and sea salt. Glad to hear that we are all the same at the end of the day, even amazingly healthy people like you! I had marshmallows for dinner last night, can't get much worse than that!!!! Lucky I hardly EVER drink alcohol eh? At least I can't binge on that!